WASHINGTON – Former Secretary of Defense Chuck Hagel calls the option of a unilateral first strike on North Korea a “gamble” with millions of lives — one that he would urge the Trump administration against. “Let’s be smarter,” he said in an exclusive interview with Defense News. “I wouldn’t do it. I don’t think you can do that,” added Hagel. The question of a “bloody nose” strike — where the U.S. would be able to strike militarily against the regime of Kim Jong Un to send a message, without triggering a full-scale war — has risen to the forefront of the North Korean crisis in recent weeks. 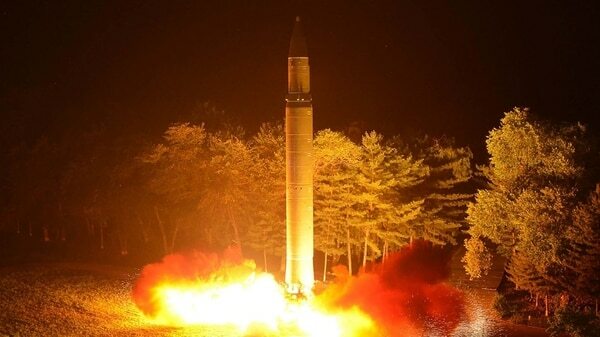 Proponents argue that such a move would deter Pyongyang from further missile tests, while opponents believe it would trigger a devastating, expansive conflict. The argument appears to have claimed at least one victim: On Tuesday, media reports emerged that Victor Cha, who had long been expected to be named as President Donald Trump’s ambassador to South Korea, would not be getting the position, in part due to his stated objections to the idea that a kinetic strike in North Korea could be executed without creating a wider conflict. In an unusual move, Cha — a former Bush administration official widely seen as a credible hawk on North Korea — took to the Washington Post to urge against such a move, which he indicates is being seriously considered by some in the administration. “To be clear: The president would be putting at risk an American population the size of a medium-size U.S. city — Pittsburgh, say, or Cincinnati — on the assumption that a crazy and undeterrable dictator will be rationally cowed by a demonstration of U.S. kinetic power,” Cha warned. More broadly, Hagel, a former Republican senator who crossed party lines and served as Secretary of Defense for President Barack Obama from 2013 to 2015, was critical of how U.S. President Donald Trump has handled the question of North Korea, in particular over Trump’s tweets. If it came to a conflict, the former secretary says America would prevail. But the question of what “winning” looks like concerns him. Instead, Hagel called for greater engagement with North Korea, citing the decision by South Korea to appear in the Olympics under a flag of unity with their North Korean counterparts. For more from Hagel, including his broader comments about President Trump and his view of the situations in Syria and Afghanistan, watch the upcoming episode of Defense News Weekly and check back with DefenseNews.com.